At the 67th minute, five Croatian defenders look on, helpless, as Mbappe drives the ball past them into the net, 25 yards from goal. Three goals up, France is going to win. But you cannot tell Luka Modric and his team that. At 4-1 it looks impossible to everyone but them. They are relentless, pummeling the French goal, demanding, roaring to be let in. Barely two minutes later Mandzukic makes a defiant run, racing Lloris down till they are toe to toe in front of the goal. He nicks a loose touch off Lloris, and puts it past him. As if to say, it’s not over yet. In all three knockout rounds against Denmark, Russia and England, they have come from behind, pushing into extra time and penalties. If there is any team to upend the odds, to grind possibility into existence with sheer grit, it is the Croatians. Croatia create chances – ending the match with more than twice the number of French shots on goal – but the French defense holds. They are not the most expensive side in the tournament for nothing, later to be lauded by pundits as “brilliant, contrary, insolent, dazzling”. But Croatia do not know that. They will run and challenge and reach for every last ball, but it is not to be. You see it in their eyes in the dying minutes of added time, that they know it is done. In the aftermath of the final whistle, the Croatians are strewn forlorn across the field. Some topple onto the pitch, head in their hands. Some stand, hands on hips or arms around their teammates, struggling for purchase on the reality of this end to their valiant campaign. Their red-rimmed eyes are vacant, searching. Modric looks haunted, shoulders hunched and headband askew. In a game increasingly dominated by superstars who draw salaries approaching the GDPs of small “third-world” nations, this World Cup has been a reassertion that football is a team sport. The teams built on the brilliance of one man have been dealt decisive exits – Argentina seemed to be waiting for a miracle from their messiah to salvage their campaign, and Portugal was not saved by the mechanical precision of CR7. And yet, if there is vindication for the notion of a star player, it is Modric. Say what you will about his conduct off the pitch – through the tournament the captain has lifted his team and his nation of 4.2 million to a footballing dream, far beyond their wildest imaginations. He has been infatigable, talismanic even, covering more distance and playing more minutes than any other player in the tournament. He has shown his quality, but as he accepted his individual honour of the Golden Ball, he could barely lift a smile. It is not what he came for. “I’m proud of this achievement, but I would be a lot happier if we won the World Cup”, he offers, pensive but composed in his post-match interview. This mentality of team before self has been a hallmark of the Croatian team, rebooted under Zlatko Dalic. Taking over only 8 months before the tournament, he has been credited for reforming a wayward team culture. “From day one, I have celebrated solidarity and unity, because the teams that didn’t have this have already gone home.” And Dalic is willing to walk the talk – when striker Nikola Kalinic refused to come on as a substitute in the opening match against Nigeria, he was put on a flight home. There is a steel in Dalic. “Nothing was given to me on a plate, unlike some coaches in Europe, who get big jobs on the back of their names as players,” he says. His start was humble, an assistant coaching position in Varteks in 2000, before taking the road less travelled to ply his trade in Saudi Arabia. Working his way up the ranks, he came to coach two of the biggest teams in the region, Al Hilal and Al Ain, reaching the final of the Asian Champions League with the latter. “I’ve always taken the harder path and had to fight for everything”, he says of himself. As the World Cup fever dies down, we will ask: what now? France’s championship-winning squad boasts the second-youngest average age in the tournament – for them, the future is bright. Only the third man to win the World Cup as a coach and a player, Didier Deschamp gets his double. But for many of Croatia’s team, what looks to be their last chance has slipped through their fingers. Modric and Mandzukic will be 36, Rakitic will be 34 and Perisic 33. The pundit tries to soften the blow with a reference to the 33 year old Ronaldo, but perhaps there is little that can take the edge off this defeat. “We fought until the end, we didn’t give up, not even at 4-1”, Modric concludes. Though sport ultimately operates in a binary of success and failure, this final was so much more than its score line. 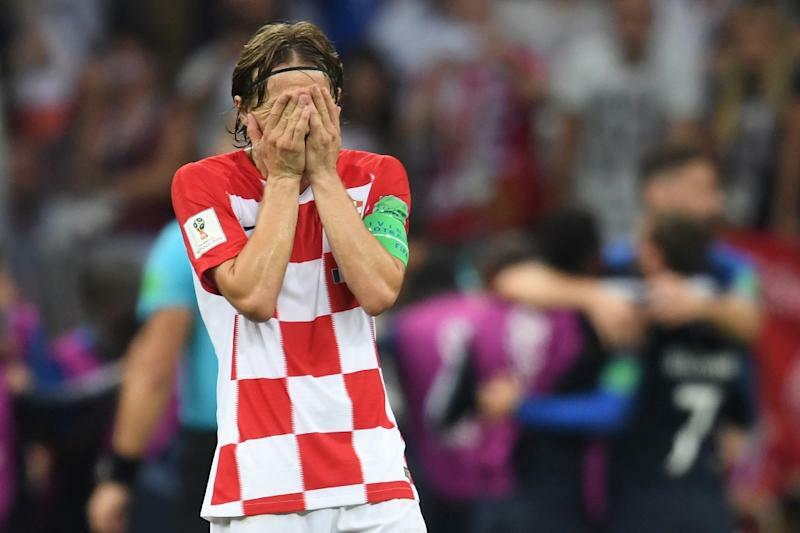 “With what we did, we leave with our heads held high” – and what greater consolation is there, for Luka Modric and his men, to have dreamed and despaired with every blistering inch of ambition in them, even if this is not the fairytale ending they wanted? They are clapped onstage by a French guard of honour to receive their silver medals, a team, in tenacity of spirit and sheer force of belief, second to none.